The Laws of Contract Bridge 2017, promulgated by the World Bridge Federation, are now released and printed. New Zealand will implement these laws from 1 August, 2017. There were two identified typographical errors in the edition released for publication, and one Law change since publication. These are in the above article. Please order your Law books from BridgeNZ - New Zealand publishers. This is a complete list of changes officially released on or before 15 July 2017. 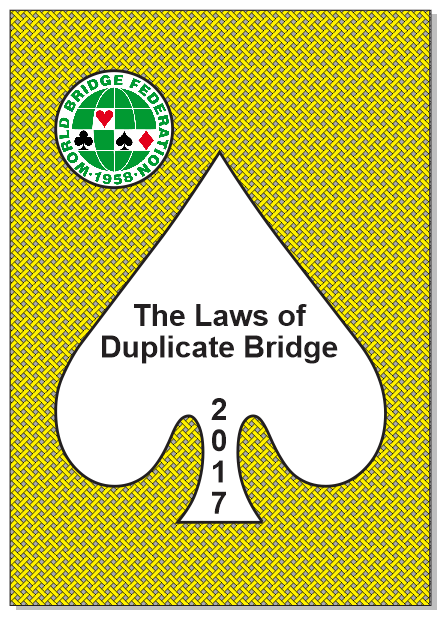 “The 2017 Laws of Duplicate Bridge are now published. Although Law 26B has been amended, the full Law 26 is below. For a format which is suitable to replace the current law click here. When an offending player’s call is withdrawn and it is replaced by a comparable call (see Law 23A), then if he becomes a defender there are no lead restrictions for his side. Law 16C does not apply, but see Law 23C. When an offending player’s call is withdrawn and it is not replaced by a comparable call, then if he becomes a defender declarer may, at the offender’s partner’s first turn to lead (which may be the opening lead) prohibit offender’s partner from leading any (one) suit which has not been specified in the legal auction by the offender. Such prohibition continues for as long as the offender’s partner retains the lead.